Rami Makhlouf and the arrogance of power. Buthaina Shaaban, in yesterday’s interview with Shadid, managed to evoke a bit of humility while explaining that the Syrian regime was winning in the struggle with the opposition. Rami Makhlouf cannot conceal the puffery of power. He threatens Israel and the region. Syria’s enemies will make hey out of this. It is true that if Syria collapses into civil war the entire region will suffer, but to use it as a threat against the very same people from whom you are asking indulgence and understanding is not a wise psychological tactic. His words cast into the starkest terms a sentiment the government has sought to cultivate — us or chaos — and it underlined the tactics of a ruling elite that has manipulated the ups and downs of a tumultuous region to sustain an overriding goal: its own survival. But even if it prevails, the uprising has demonstrated the weakness of a dictatorial government that once sought to draw legitimacy from a notion of Arab nationalism, a sprawling public sector that created the semblance of a middle class and services that delivered electricity to the smallest towns. The government of Mr. Assad, though, is far different than that of his father, who seized power in 1970. A beleaguered state, shorn of ideology, can no longer deliver essential services or basic livelihood. Mr. Makhlouf’s warnings of instability and sectarian strife like Iraq’s have emerged as the government’s rallying cry, as it deals with a degree of dissent that its officials admit caught them by surprise. He echoed an Arabic proverb, which translated loosely, means that it will not go down alone. He serves as an instrument, too, in Mr. Assad’s vision of economic modernization, where Syria serves as a crossroads of regional trade and a hub for oil and gas pipelines that link Iraq and the Persian Gulf to the Mediterranean and Europe. Cham Holdings, a vast conglomerate with a portfolio of $2 billion, in which Mr. Makhlouf owns a quarter of the shares outright, is at the forefront of that faltering scheme. Mr. Makhlouf suggested that economic reform would stay primary. Perhaps you can explain to us who Mr. Makhlouf means by the word “we” in the last paragraph in the article. The last time I checked, Syriatel or Cham holding had no “fighters”. Is it like “we own” when he says “we have”. yes another glaring example of Bashar’s reforms. Reforming the Syrian economy to fit neatly into his cousin’s back pocket. Ten sentences out of a three hours interview (Shadid keeps the rest for a book). I wish he said anything useful or interesting! Between the lines, would the message be: no matter what you do, we will not drop the bilateral defense agreement with Iran? About Erdogan’s comments on the situation, comparing it to Halabja and Hama, has Turkey finally given up its deal for a pipeline bringing gas to Europe from Iran? How much was Turkey promessed to withdraw its 25,000 workers from Libya, who are now probably staying jobless in Turkey? Any journalist to interview them? Bravos to Anthony Shadid. This article on Rami Makhlouf is probably the single most revealing piece of journalism into the heart of the Syria regime in years! He is fair and balanced with his analysis. The thing that was most surprising was that the regime actually allowed such an interview to happen in the first place. By allowing Makhlouf to be interviewed for a front page story in the New York Times they are either inept in public relations or indifferent. Like it or not, Maklouf has become the new face of the Assad family to the rest of the world. The other shocking thing of the report was Makloufs tone! His threats and taunts did not go unnoticed. Nor did his claims of ambivalence towards the thoughts of the rest of the world – some would call it arrogance. Basically, here is a person of privilege who has attained his wealth through nepotism and corruption threatening to fight till the end against a populace that no longer wishes to be exploited by him. The fact that thousands of innocent Syrians have been killed or seriously injured by the apparatus controlled by his family never seems to cross his mind. But rest assured that to the average reader these atrocities were never far off. IN short the interview was a disastrous portrayal of the Assad clan. It was almost as if it was an unintended taunt to the rest of the world to do something about it. This kind of an interview surely makes the blood boil. What arrogance! But I prefer to look on the brighter side. This junta is desperate and frightened. You can read it between the lines, in both interviews, Rami’s and Bouthaina’s. When I read the part about “we have a lot of fighters.” it was clear that he was speaking on behalf of the Syrian intelligence. Shadid also points out in the artcile that Makloufs brother is head of Syrian Intelligence in Damascus. Funny how they all sound the same. This interview reminds me of one the interview Kaddafi’s son did. Same blabber. Reformer and Assad’s family in the same sentence is an oxymoron. They will never reform. 2011 is the begging of the end of the Assad’s rule in Syria. The sooner it is over the lesser the damage to the region. And not the otherway around. There is no continuity without unity,this sealed the fate of the whole sect, if it was true. Butheina Shaaban is just hoping. The UN investigating committee is not allowed to visit Deraa. Turkish PM comments are very important,it isolates Syrian regime.who has no friend in the neighborhood anymore. He means the ruling elite, meaning the mafia gangsters. This is a long awaited piece, it confirms even further how this country is ruled. I disagree with your statement “this sealed the fate of the whole sect”, simply, because the majority never benefited from this mafia, to the contrary. They are used as accessories to advance the ruling elite power. Unfortunately they turned some of them to monsters, like the Shabihas, this is a self hating attitude that will come back to hunt the Assads and Makhloufs from within. Many educated Alawites are anti Assads Mafia, some are vocal, the majority are silent. They are a sliver of the Syrian society that reflects to some degree the rest of the pie. Shadid just spoke about his trip to Syria on “Here and Now” on NPR this afternoon. He says that the goal of his trip was to interview Makhlouf and that he had spent a lot of time trying to make it happen; when he was there, he was told Shaaban could talk to him too. Poor coordination? I wonder what happened to my post? I was asking you if you has anymore information about the supposed ‘desintegration’ of the Syrian army so diligently described by Mr Olmert? Also if you know why, now that death in the demonstrations lost the headlines, there is a flurry in the western press of dark predictions of isolation and doom for the government of Bashar al Assad. “…………Mr. 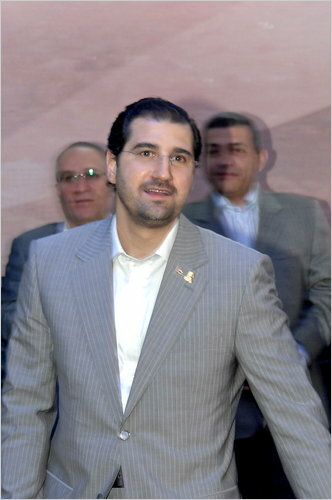 Makhlouf suggested that economic reform would stay primary. Political Reforms comes first, only then will fair distribution of economic reform dividents among the populace are insured. Should Political reforms comes afterward, it will be just to serve the unfair status quo after economic reforms completed, another powerless and obsolete political front to replace the old one. It is obvious that the Syrian government has a poor PR compared to the opposition. By the way, anyone knows how many syrians are employed by Makhlouf ( Syriatel etc..) and how many no-syrians? It is obvious that this regime choose their death,they are not willing for reform and not willing to engage with dialogue,they are suicidal,they can not fight 70-80% of the syrian,The Assad clan are not even5%.they can not survive,this is the end of Assad dynasty,they are foolish in choosing this fate,as I said before Bashar is not a smart one,and he is not a leader,They do not look for the betterment of the syrian people. Those who support the regime,should know,they are not neutral,they are not objective,nor reasonable, they keep posting from the regime media, all what they say is not believable,it is not credible,it is waste of their time,if they love Syria they should call for dialogue and reform, and stop telling us that the unarmed protesters are killing officers and soldiers who are well armed , the truth will be known. You can tremble you can shake,you loose sleep and get headache ,you will wet your pants,there is no use, the end is comming.you are no longer Baik. This interview and the interview with Buthaina Shaaban yesterday, signify the Syrian government increased confidence in defeating the demonstrators. It is clear to me that the government is now on the offense, and feels certain it will prevail. It’s MORNING EDITION, from NPR News. I’m Steve Inskeep. In the midst of what’s being called the Arab Spring, Syria has not let up in its crackdown of protesters. The government has been particularly harsh in Homs, a city that’s been one of the centers of nationwide protest. Soldiers have occupied that city and are searching house to house for those opposed to the regime of President Bashar Assad. NPR’s Kelly McEvers joins us on the line from Lebanon, just across the border from Homs. And Kelly, what more are people telling you about what’s happening there in Syria? KELLY MCEVERS: One man we spoke to on the phone, who had just fled Homs, says that that city right now – the way he described was – he said it’s a place that separate from Earth. He said it’s just unworldly what’s going on there. He says that when security forces come into the city, they strike with their tanks first. They don’t even bother using their rifles, says sometimes they even shoot from helicopters in certain neighborhoods. He says there’s places in the city where bodies are lying in the streets. People try to remove the bodies, but they can’t even go out of their homes. He says they’re putting men and women in separate rooms and interrogating them. Another man told us that people who even try to hang their laundry out their windows, from second-floor windows, get shot at. He says that schools are closed, the province is basically paralyzed. They’re running out of bread and salt, basics. MONTAGNE: And, Kelly, it does sound like the crackdown is intensifying. MCEVERS: You know, it’s hard to say with absolute certainty, because we are not allowed to enter Syria to verify the reports. But what I can tell you is that residents and activists are telling us that the military is entering more and more cities, detaining more and more people. Activists are saying that now it’s up to 10,000 people who’ve been detained or have disappeared. They’re saying this is forcing many activists into hiding, which, of course, makes it harder for them to organize and to get information out. Phone lines are being cut. Internet connections are being are being cutoff. Even satellite phones now are being jammed. This, of course, is troubling, because this has been the main way for the opposition to get information out, you know, through Skype calls and uploaded videos. Without that, the world will have no idea what’s going on inside Syria. MONTAGNE: And the government, what does it say it’s doing? MCEVERS: A Syrian government spokeswoman – who’s also a close advisor to Syrian President Bashar al-Assad – told The New York Times yesterday that, you know, she’s fairly confident this whole thing will end soon. She, like Syrian officials, have been, for several weeks, characterizing these protesters as not, you know, reformers or people who are seeking, you know, more freedoms, but rather a combination of – what she said – fundamentalists, extremists, smugglers and ex-convicts. And that’s why, you know, the government says it’s using so much violence. Of course, activists say the security approach to the problem is no way to solve it. There’s no way you can occupy an entire country. You know, security forces might move into a few cities, but with then once they leave, the protests continue popping up. So at some point, activists say there’s going to have to be something beyond the security solution. There’ll have to be a political solution. MONTAGNE: Although one wonders if a political solution is likely at this point. MCEVERS: Yeah, I mean, the Syrian government says – the same spokeswoman says that, you know, the government’s been reaching out to the opposition. But they’re mainly talking to the so-called sort of old guard, opposition figures who’ve been around for a long time and who’ve always kind of been willing to work within the system. The question is: Will that satisfy this newer opposition? I’m talking about the young protest organizers who are scattered around the country, and people who’ve since been radicalized by this violence at the hands of the government. How will they be satisfied? Will they be satisfied with any anything but revenge? Revenge in the form of, you know, Assad stepping down, which is seeming more and more unlikely? Or in the form of more violence? Either way, it’s really not a pretty picture. MONTAGNE: NPR’s Kelly McEvers is in Lebanon, just across the border from Homs, Syria. I’m offering a lollipop for anyone who can post a greater number of links than Mina. And why is she constantly in the international sphere when the discussion is on Syria? Why not just post “double standards” instead of all those links? © Copyright 2011 Independent Newspapers (UK) Limited. All rights reserved. New York: Western nations have launched a new bid to get the UN Security Council to condemn Syria for its deadly crackdown on opposition demonstrators, diplomats say. Syria’s refusal to let a UN humanitarian assessment team into the protest city of Dara’a was raised by Britain at a Security Council meeting yesterday. Britain is leading lobbying for a Security Council resolution warning Syria over its crackdown, diplomats say. In parallel, Western nations are stepping up a campaign to stop Syria getting a seat on the UN Human Rights Council at a vote next week. But efforts to pressure Syria are being held back by opposition from Russia, China and other countries on the 15-nation Security Council, who say the French-British-US coalition staging air attacks in Libya has gone beyond its UN mandate. Syria again angered its critics by refusing to let a UN humanitarian team into Dara’a on Sunday. Hundreds are feared to have died in the city, which has become a symbol of the protests against President Bashar al-Assad. The UN announced on Thursday that Syria had agreed to let a UN team into Dara’a, after UN Sscretary general Ban Ki-moon appealed directly to Assad. Everybody wants dialog and reforms. Who will the opposition dialog with if there is no more government and Bashar is out, as you are wishing? What reforms do you expect in the total collapse of the government structure and institustions? It becomes a “nation-building” task from scratch. Do you think the ‘opposition’ alone can do that? Who will help ? the US? The EU? The Syrian army? We are not in Egypt. Organized political parties: we are not in Tunisia. Any suggestion? What a weird remark? Syria is not on Mars.. it is in the middle east and the events in the region and the international scene are affecting each other. Maybe you were not aware of that. Eat your lollipop, it suits you! Do you think the ‘opposition’ alone can do that? Who will help ? ‘Jealousy’?!?! Sure people are in the street being killed because they are ‘jealous’ of his hair style! Stop treating me like this. I’m warning you (lower lip quivering). Can you prove you’re a PhD holder? I can’t wait for the next party leaflet from محمود. Great additions to the discussion. Can you prove you’re a female!? Mr. Makhlouf is arrogant, he should keep quite and humble. Sorry, I can’t find it. There is a video about 5 days ago where someone is asked if the tanks were firing at the people and the guy says ‘no, they were firing at each other with the amn’. “The four Swedish participants left the hotel and headed back to their homes and jobs. A few days after that and as a part of my study visit I’ve visited Swedish Think Tanks and other opinion and policy making institutions. In the meetings I was told about Sweden political parties, social system and the well fare sate establishment. Sweden at that time was three weeks away from the European Union Presidency. In the Think Tanks they had no real interest, knowledge or studies about The Middle East. They are so much focusing on Sweden. They have managed to do that as political institutions for a long time. And they have done an amazing job but they cannot do that anymore while they are part of the EU political structure and defiantly not when they are in the presidency. I met parliamentarians from different political parties as well. Three of them sit on various committees including EU and foreign affairs. Those meetings were more productive and sort of relief. Nevertheless while visiting the Foreign Office Press center; a lady from the MENA desk answered angrily some of my boisterous questions stating basically that Sweden does not have a Foreign Policy when it comes to the Middle East. She said they will follow the EU. I do not think that is destined. And on that matter I will be having more to say but not here. This is neither the place nor the time. PS: The fifth Swedish participant was born and brought up in Sweden. Nevertheless in the eyes of the writer she is the result of a regionally approved and internationally blessed legal utopian marriage of convenience. The participant is the product of the fathers and the mother of most Lebanese. The rest of The Lebanese are still is sperm stage. Therefore she will be mentioned with the Lebanese participants. The fathers are : Hassan Nasroulah[i], Al Mufti Kabani[ii], Patriarch Sufaier[iii], Ahmadinejad [iv] . The mother is : Nawal Al Sadawi[v]. [i] Hassan Nasroulah is the religious, political and military leader of Hezbollah, Lebanon. Hobbies: Assassinations, small and big wars, terrifying people, shouting and screaming, praying in public and playing the big hero. [ii] Al Mufti Kabani is the Muslim Suni highest authority in Lebanon known as Mufti. Hobbies: Praying in public, speaking nicely about the Saudi Royal family, preventing equality legislations from happening. [iii] Patriarch Sufaier is the Christians Maronite highest authority in Lebanon. Hobbies: Praying in public, preventing equality legislations from happening, appearing on every news channel in the country. [iv] Ahmadinejad is the lunatic homophobe who stated that there are no homosexuals in Iran. He managed as well to cheat in the last Iranian elections and still proclaims himself the Mullah’s spoilt president. Hobbies: has plenty ranks on top hanging Iranians whom he considers perverts. It is probably a reaction to the European sanctions that were enforced today. Dr. Landis described it as the “arrogance of power.” I see it totally different; it shows a lot of scare and sense of weakness that I did not expect at this stage. He sounded very much like an Alawi villager rather than a business tycoon. His last sentences made it very clear, he was saying: if you think you can let the Salafis exterminate us, you are wrong, we are going to fight to the last man. He was alluding to the 10 million vs. 10 million scenario that I talked about in the first week. The problem with the Western world is that they refuse to see the stark sectarian nature of this situation. Many Westerners even doubt that there is such thing as the Wahhabis in the uprising. This is a major problem. It is not surprising that you can’t understand the man’s feelings. He is not threatening the West or Israel. He is just so desperate and scared. He can’t understand why Europe sanctioned 13 security officials (out of whom 10 are Alawis) who are fighting against a Wahhabi uprising. The Wahhabis want to exterminate the Alawis. This is what they say on their websites and TV channels, and this is what their sacred books say. The Alawis are scared to death. They are fighting a battle for survival. When you are in such a situation and when you see that nobody (in the Western world) believes you, you start believing in universal conspiracy. This is the only defense mechanism that can help you keep fighting. If you want to understand the psychology of the Syrian regime, you must stop seeing them as an evil regime. Those people see themselves as a minority threatened by annihilation. Makhlouf’s reaction is so strange and unusual. It is obvious that the sanction news has enhanced his feelings of persecution and paranoia. You have to understand that there is a real thing called the Whhabis/Salafis who want to exterminate the Alawis like Ibn Taymiyya did. Even if they don’t exterminate them, they are going to persecute them. This region is neither Europe nor America. People here are brutal. The Wahhabis can easily behead a man with a knife. They did it a lot in Iraq and video taped it. To the Alawis, this is not news that they see on TV—it is a real threat that they deal with on daily basis. There are many Alawis who have already been brutally murdered and mutilated in this uprising. I have never talked to an Alawi person in Syria without feeling that they are scared of me. Those people are full of fear, even if they pretend otherwise. Thanks Mina. That was very long and interesting. The Western countries are starting to see the gutter rats showing their nose in Egypt and in Tunisia. It is not only the Alawis who fear the Wahhabis, it is also the Christians. We can see now what is happening in Egypt: the salafists are finding any pretext to kill the Copts. If the Egyptian government does not do an immediate, ‘brutal’ and ‘ferocious”crackdown’ on the Salafists, the Copts will arm themselves and violence will generalize. The danger of a violent civil war is present in Egypt. Don’t underestimate the Salafists. He souds like the Gaddafi’s SOn Seif alarab, We will fight them till the end, They are obssessed with ruling the country. The mere fact that Rami is not in jail is a testimony to how corrupt the regime is,and the idea of giving this thief an outlet to express his opinion is an insult to every honest Syrian. The regime should not interpret the chosen silence of many Syrians as a sign of approval of its policies or acceptance of a parasite like Rami who,if he is a true patriot as he claims,should sell his shares of syriatel,stay out of those fishy deals and pray that Syrians do not send him to where he and his likes belong: jail. I was watching today a Wahhabi channel and they showed a “letter of support” sent to them by “Christian young men.” Not all the “Christians” who claim to support the uprising on the internet are fake, there are some real Christians who show their support because they believe this will appease the Wahhabis. The same is true for the other minorities. There have been many demos in the Druze mountain and in Salamiyya. The minorities are scared and this is obvious. The Wahhabis can never be appeased. So many people tried to reach agreements with them. It never works. The civil war scenario is unlikely now. It would have happened if the Islamists in Aleppo and Damascus had joined the uprising. The regime successfully managed to neutralize many Islamists by using tactics of dividing and conquering that I talked about before. The regime successfully divided the Islamists and now it is in the process of conquering them. Things are going well for the regime. Even if the Islamists in Aleppo and Damascus revolt at a later stage, it will be too late. Makhlouf’s interview is an overreaction to the European sanctions. Things are not that bad. ‘Businessman’- what a joke, and what a sadly inflated sense of his own abilities. People like Rami only prosper when the game is tilted heavily their way- by being at the core of a corrupt ruling elite. By agreeing to an interview, he displays his lack of judgement. If the regime falls, this man- with his ill-judged statements and ego-maniacal threats- should shoulder a lot of the blame. The best thing he could do is retreat to his yacht(s) on the French Riviera. Remember that Kerry, as the article points out, has been the congress delegate to Damascus and one of the very few advocates for engagement with the Syrian regime. Also, it looks like the family is well and truly united. Any earlier arguments or talks about Dr. Bashar’s inability to rein in these around him should be dismissed. What do you think of the Syrian government’s murder of nearly 1000 innocent Syrians? Will you lift a finger to criticize the Syrian government or does that take too much effort on your part? Or maybe your masdrassa education prevents you from criticizing a “brotherly” Arab government that kills its own? 333,This scared gang could kill you or your bigot relatives and then tell in their media that you were terrorists. What asad-makhlouf paranoid gang dream for is to make sure that you fear their tools of oppresion torture,prison,killing again in the 2010’s. اننا نكره حكامكم ! نكره ممارساتكم ! تدخلاتكم ! نكره أسلوبكم! لن نشاهد منكم غير نتاج دمار مجمع التصنيع الحربي الأمريكي ! هل تريدون أن نفرش لكم الزهور في ساحات سقوط صواريخكم ؟كيف تدعون الانسانية و انتم تنفقون أكبر ميزانية عسكرية في العالم ! هل تعتقدون ان العالم ينسى بسرعة اجرامكم في تدمير هيروشيما و ناغازاكي ؟ كيف تنادون بالديمقراطية و أنتم بحاجة دائما الى خلق اعداء افتراضيين لتبرير انفاقاتكم العسكرية! هل تعتقدون أنكم الوحيدون ماضيون في العلوم ؟ انكم قمة في التخلف الأخلاقي ! انكم عبيد المادة ! سحقا لدهنيتكم ! سحقا لعقيدتكم المدمرة ! It is a really despicable interview made by this Makhlouf guy. Even more than the words uttered by Bouthaina Shaaban who continues to write senseless articles in the Wahhabi Al-Sharq Al-Awsat with a photo of her when she was close to 15 years old!